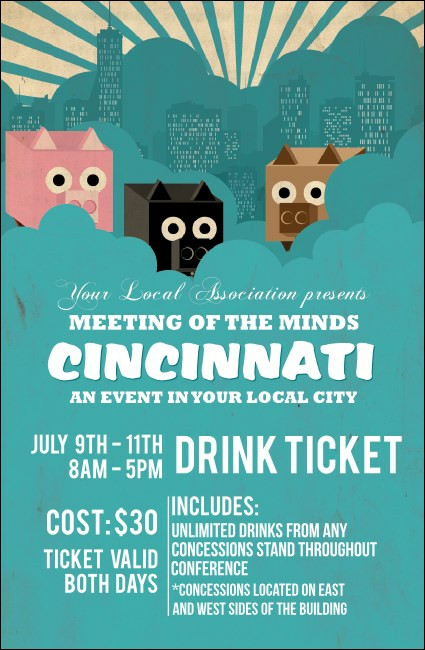 Raise a glass to Cincy with this fun Cincinnati Drink Ticket. Featuring the impressive Cincinnati skyline and three sweet flying pigs peeking out from some fluffy blue clouds. From Over-the-Rhine to the Great American Ball Park, toast your guests at your next Cincinnati concert, conference, or fundraiser with your unique Drink Ticket. Planning a special event? Find the right ticket at TicketPrinting.com!